About Born Free. Size1 piece. Provides the simplest, most effective way to swaddle newborns. Expiration Date: 9/2019 or later. Product Specifications. SlumberSack wearable blanket. 2 direction zipper for easy diaper changes. It will prevent the startle reflex that can wake your baby. Extra soft, simple adjustable wings provide a perfect fit for even the wiggliest babies. For 0 - 3 Months, 7- 14 lbs / 3.2 - 6.4 Kg. Harness slit works with most 5 point travel harnesses allowing you to easily transfer baby from the pushchair or car seat straight into the cot without disturbing them. Lot Of 3 Swaddling Blankets: Summer, Miracle Blankets. Summer Infant are size S/M, 7–14lb, miracle blanket is a little larger but no size indicated. moderate signs of wear on fleece but clean with no stains. Condition is Pre-owned. Shipped with USPS Priority Mail. For sale is a Original Swaddle Graphic Car Large Design Creates Cozy Better Sleep Safe 3 Pack . The package is slightly damaged. See pictures for further description. If you have any questions please feel free to ask. I ship within 1 to 2 business days of payment. Every baby needs to sleep safe and sound! Ingredients or Materials: Exclusive of decoration: 100% cotton. 18" x 13" (46 cm x 33 cm) surface. Lightweight material. Made from TPA, a non-latex, non-PVC, non-Phthalate material. SAFER SLEEP. The secure design creates a cozy, womb-like feeling for baby and prevents startle reflex that can wake your infant. Manufacturer Part Number. Assembled Product Weight. 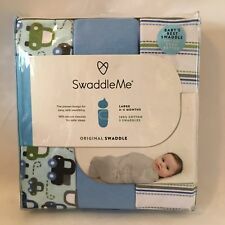 Summer Infant 2 Count SwaddleMe adjustable infant wrap * Monkey Fun *Small / Med 7-14 lb 100% cotton Buy with confidence shipping is always fast. Don’t forget to check out our store for other great deals. Condition is Pre-owned but never worn since my baby never swaddled. Or theSlumber Sack wearable blanket. Swaddling soothes newborns by recreating the familiar, comforting. Slumber Sack. Grows with baby. The Team Monkey Plush is an adorable plush monkey that makes a soft and cuddly friend for your baby. Makes a great gift, and coordinates back to the Team Monkey Bedding Collection for your baby's nursery. THIS IS VERY HARD TO FIND. THIS SOFT BLANKET IS A VERY PALE IVORY (FOR SAND!). HE HAS A HEART FOR A NOSE, AND BROWN HEAD, ARMS AND LEGS. THIS IS A SOFT BLANKET, WITH A POLY-SATIN EDGING AND BACK. Perfect baby gift. Material Type: Latex Free, Phthalate Free, BPA Free, Lead Free, Fleece. You're already purchasing the item. Quality Products. Batteries required: No. 100% Polyyester. UPC: 012479144888. 031919 B350 4z. Color is coral. This soft and snuggly baby blanket is from Summer and is a pink plush with a leopard print satin trim. There is a princess ballerina elephant applique on the front with a sewn-on tutu. It is in good to very good condition with some minor snags on the satin. Sicuro e sicuro quando il bambino è avvolto. Who we are. Caratteristiche del prodotto. NATURE’S PUREST Baby Blanket Lovey Crib Blankie Safari Jungle Giraffe Neutral Boy Girl. Up for sale is this beautiful baby blanket in neutral colors. Blanket is light tan/khaki-colored cotton in a jersey knit on one side, and a textured striped knit cotton on the other side in cream, tan, and green stripes. Soft plush fleece with ballerina elephant applique and brown leopard print trim. Baby blanket. 100% organic cotton. Col or: blue. Your little one will love playing on, or being wrapped up in this plush blanket with Monkey, Giraffe and Butterfly print, great for baby. The blanket is made from soft 100 percent polyester fleece and is 30" x 40" in size. Your little one will love playing on, or being wrapped up in this plush blanket with Jungle Buddies print, great for baby. The blanket is made from soft 100 percent polyester fleece and is 30" x 40" in size. THIS SOFT SAGE GREEN BLANKET HAS A GORGEOUS JACQUARD DESIGN, AND IS EARTH-FRIENDLY, FREE OF AZO DYE, SAFE FOR BABY'S SENSITIVE SKIN! This lovey is approximately 12"×12". Please look closely at all photos. Feel free to ask any questions you may have. Style: "Swaddle Square" blanket. Type: Baby Blanket. YOU WILL RECEIVE EXACTLY WHAT IS PICTURED/PHOTOGRAPHED. WE ONLY HAVE ONE OF THESE SO MAKE SURE TO BUY IT NOW ASAP! 100% cotton muslin is naturally breathable for baby’s comfort. 100% cotton muslin gets softer with every washing. Muslin is lightweight and naturally breathable for baby's comfort. Large blanket size (40x40) is perfect for swaddling. Style: Swaddle Blanket. Type: Baby Blanket.